I’ve got pasta salad on my mind! I’m imagining summer picnics, backyard BBQs and potluck get togethers with friends. I’ve been making them for years and have several pasta salad recipes in my recipe index if you want to take a peek. I was brainstorming what I should make and remembered the most delicious chicken salad I made a couple years ago for a post for the Chicken Farmers of Canada. 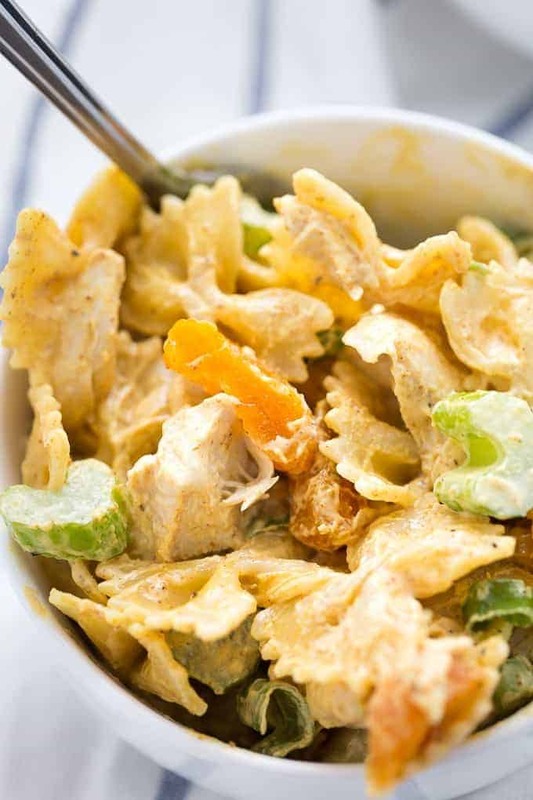 This recipe is a spin on their Famous Curried Chicken Salad and it does not disappoint. 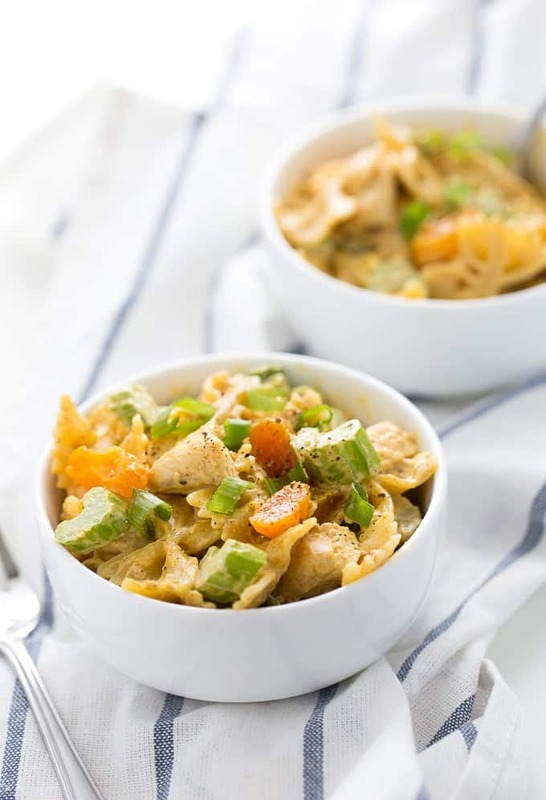 I’m calling it Creamy Curried Chicken Pasta Salad. It has a mildly spicy creamy dressing made of curry paste, mayonnaise and sour cream. For veggies, I add celery and green onions. Those little orange pieces look like they could be carrots, but they are actually dried apricots, sliced up. They complement the spicy dressing with a bit of sweetness. I used bowtie pasta because I like the way it looks for presentation. Any type of pasta would do though. Use whatever you have in your pantry. You may be tempted to dig in right away, but hold yourself back. Let it chill for a few hours in the fridge so the flavours really have a chance to permeate the pasta. It will be worth the wait, trust me. Serve this salad as delicious to burgers, hotdogs, steak, chicken or whatever you are grilling this summer. 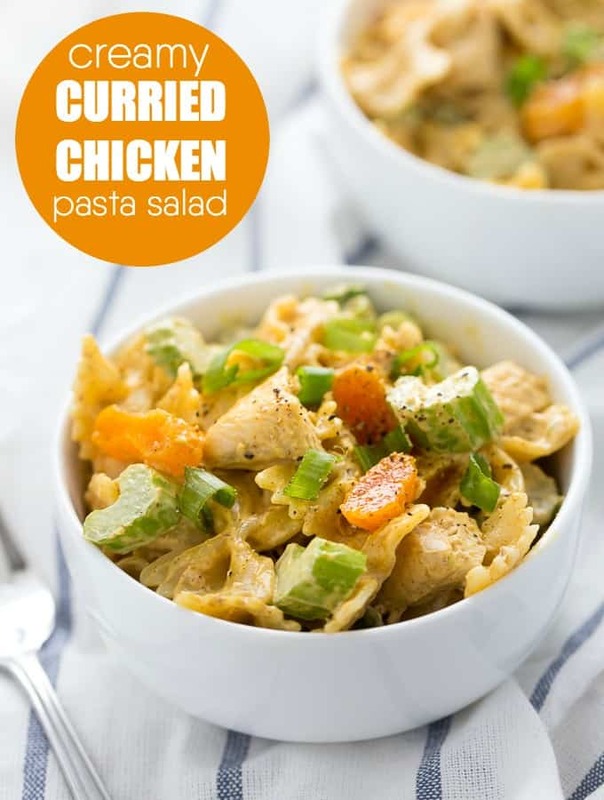 For more pasta salad recipes, check out my Pizza Pasta Salad, Jalapeno Ranch Pasta Salad, Bruschetta Chicken Pasta Salad, Chicken Fajita Pasta Salad, Roasted Pepper Pasta Salad, Greek Pasta Salad, Chili Pasta Salad and Easy Bacon Pea Pasta Salad. Do you serve pasta salad in the summer months? Creamy, mildly spicy and absolutely delicious! Serve this summer side at your next backyard BBQ, picnic or potluck. 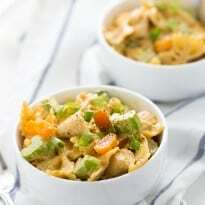 In a large bowl, combine chicken, celery green onions, apricots and pasta. In a small bowl, stir together mayonnaise, sour cream, mild curry paste and salt. Pour into pasta mixture and stir to combine. Chill for 1 to 2 hours before serving. Love Pasta Salads in the summer and always looking for new ones to try, thanks for sharing this one. It sounds and looks good! I have never tried recipes with curry in it but this recipe looks so good I have to try it. mmm this does look really delicious and very pretty. I love bow ties, too. I like making bow ties from scratch, it is really easy, with egg in the flour, so they add a lot of nutrition. I’d love to try this! I love chicken salad but never had one quite like this one, I’m going to have to go to the store and pick some stuff up and make this salad!! This looks delicious and perfect for summer. I think the addition of the orange is really interesting for this dish. I really like macaroni pastas in the summertime. What a great summer time salad. I love curry and the addition of dried apricots sounds like a delicious twist! This sounds like a delicious pasta salad!!! I’ve never used curry paste. This looks so good I am going to give it a try! I’ve got leftover chicken that would be good for this recipe……and we LOVE curry. Thanks for the inspiration! I love the taste of curry and am always looking for a new twist on a salad.This is it! !This is my next go to salad and I am excited to try this.Thank you. This sounds like a great pasta salad. I bet my hubby will love this! What a fabulous recipe! Thank you for sharing! What a great salad to enjoy for the hot summer days. Thanks so much for sharing with Full Plate Thursday this week. Hope you are having a great day and come back to see us real soon! I bet the curry will give this salad a unique salad experience. I don’t have much experience with curry, but I bet it adds a nice kick. Yum, I have never thought of using curry in pasta salads! I bet it tastes just as flavourful as it looks! !